Now in its fourth year, the Deadwood Red Dirt Festival has fast become one of the biggest music festivals in the upper mid-west. 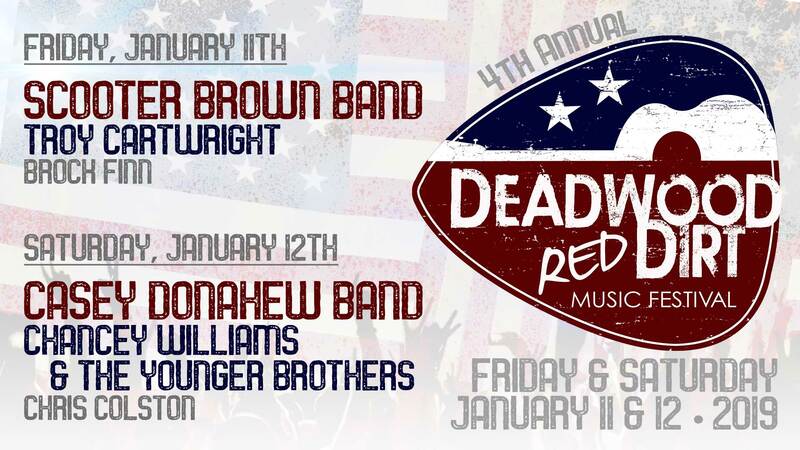 After last year’s colossal success, event organizers are eager to bring back two incredible days of music featuring the Casey Donahew, Scooter Brown Band, Chancey Williams and the Younger Brothers Band, Troy Cartwright, Chris Colston and Brock Finn January 11th & 12th in the Deadwood Mountain Grand Event Center. Tickets on sale now by calling 605-559-1188 or visit Ticketmaster.com. Please be aware of third party ticket brokers as Ticketmaster is the only official ticket outlet for Deadwood Mountain Grand. Red Dirt is the color of soil found in Oklahoma and Texas. They are the homes of a music genre that spawned Outlaw Country legends like Waylon Jennings and Willie Nelson and created a home grown movement of Americana, folk and alt-country sounds. Some define Red Dirt music as “country music with attitude”. Others say it’s a state of mind as much as it is a sound – a sound that successfully closes the gap between rock and country. Headlining the Friday night performances will be the Scooter Brown Band. After 4 years and 3 months, 2 tours overseas with 1 tour of combat in Iraq as a United States Marine, Scott Brown traded his guns in for guitars and hit the road. The Scooter Brown Band was formed in 2005 and played mainly in and around Houston, Texas. It wasn’t until 2009 with the release of their first studio album, “Between Hell & Texas,” that they gained a notable presence in the Texas music scene. Along with their growing notoriety came their first radio single “Apology.” Other radio releases were soon to follow and include “Whiskey Talkin”, “Soldiers Christmas Eve”, “Feels Like Home,”, and “Summer Song”. In 2010, Scooter Brown Band put out the album “LIVE at BIG TEXAS”. In 2013, they followed up with their next studio album, “VALOR.” The newest self-titled album “Scooter Brown Band” released on September 18, 2015. Also schedule to appear for the Friday night performances are Troy Cartwright and Brock Finn. Saturday will feature Casey Donahew, Chancey Williams and the Younger Brother’s Band, and Chris Colston for a full night of music. Casey Donahew has carved out quite a career over the past decade, attracting a solid base of loyal fans that flock to his legendary live shows. Building his career from the ground up one show at a time, he’s managed to perform on countless stages night after night in front of thousands, topped the Texas music charts several times, released four albums independently to critical acclaim, and forged a path all his own through the music scene without the aid or muscle of a major record label or power-suit management company. Warming up for Casey Donahew on Saturday is regional powerhouse from the great state of Wyoming, Chancey Williams and the Younger Brother’s Band. Chancey and his incredibly talented band have relentlessly toured the Western United States, developing a rabid fan base not seen from the Cowboy State since Chris LeDoux. The band has shared the stage with dozens of artists, including Lady Antebellum, Miranda Lambert, Eric Church, Brantley Gilbert, Travis Tritt and Thompson Square. They’ve also enjoyed bills with Texas contemporaries Casey Donahew and Stoney LaRue. Chris Colston will be opening the show in the Grand Event Center Saturday night. An east Texas native, Chris Colston has recently sent a storm sweeping through the Texas music scene with the release of his latest EP, “Gone.” The title track has surpassed more than 200,000 streams on Spotify in just three short months after its release, and with that, Colston has set the bar quite high for himself as well as other upcoming artists in the scene.